Use this lemonade syrup to concoct drinks with just the right balance of sweet and sour! 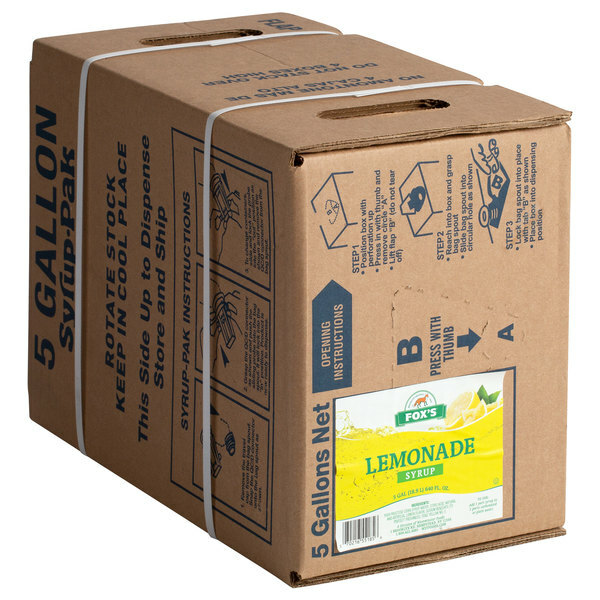 Fox's 5 gallon bag in box lemonade syrup makes it easy to refill your soda machines and always have fresh beverages on hand. A corporation specializing in irresistible ice cream toppings, sweet syrups, and fizzy soda mixes for over 100 years, H. Fox & Company takes great pride in their products. Use this lemonade syrup to quickly and easily serve lemonades at your movie theater, stadium, restaurant, diner, fast food operation, or take out station. 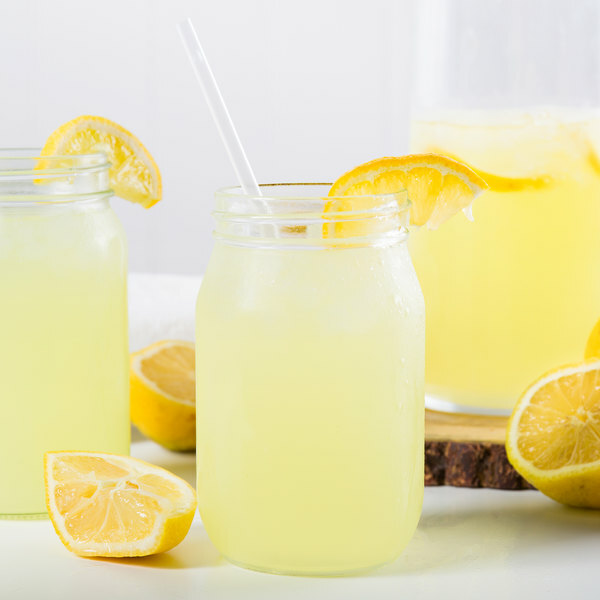 Its also great for crafting signature cocktails such as spiked lemonades, margaritas, and sangrias, or for making your own speciality flavored lemonade with your choice of fruit or syrup flavorings. Your patrons are sure to be pleased with the fun refreshment anytime throughout the day. Fox's bag and box are recyclable, and this lemonade beverage syrup reduces waste by dispensing only the desired amount to mix a drink. Each 5 gallon bag in the box will yield approximately 30 gallons when used with a soda dispenser. Simply add 1 part syrup to 5 parts water to use, and make measuring hassles, spills, and flat products a thing of the past! We were using a powder lemonade concentrate in the past but it doesn't mix easy. Switched over to the syrup and it has made mixing a breeze. Tastes just as good. Fox’s bag in a box lemonade syrup tastes just like name brand lemonade. We did a taste test with our employees and they chose Fox’s! 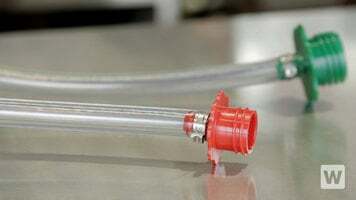 We were looking to replace a lemonade concentrate we were getting from a local beverage supplier. This one is a decent alternative, not as strong of a sweet lemon flavor as our old one but its close. Like the 5 gallon size versus the 3 gallon we were getting. 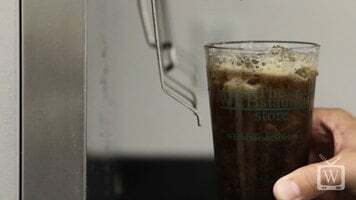 This product is very cost effective compared to pepsi's brand and it comes in 5 gallons making it even more affordable while lasting longer than pepsi's. 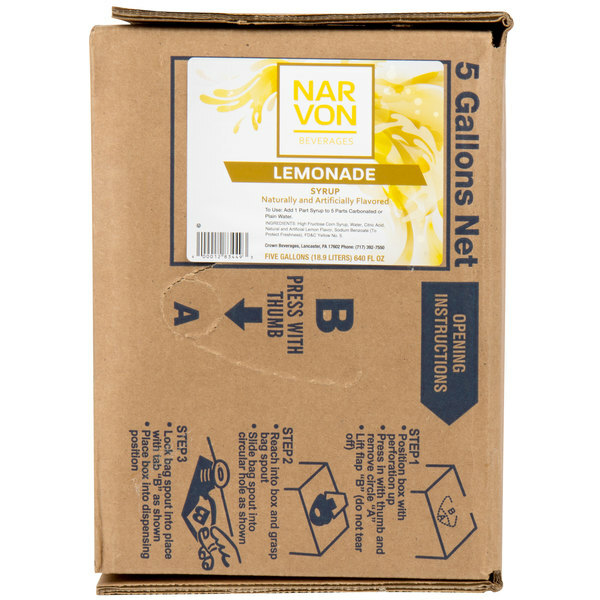 The Lemonade is as good as name brand but the boxes are always broken when i have ordered. The date on the boxes is also always past. I dont know if this is the expiration date or the creation date. Fox's is a great brand that has great syrups at a low cost. The syrups work well to create in house sodas. The lemonade syrup is perfect and has a great fresh squeezed flavor. A great buy. Fox's bag in box drink syrups are a great value. They come well packaged in sturdy cardboard boxes. A lovely lemonade with a wonderful flavor. Taste really fresh and customers love it. The product has worked well for us and taste great. The reason i give three stars is both times i ordered, the boxes were damaged and/or opened and they could not be mounted correctly. Great product for the price. It is slightly watered down tasting compared to the name brand products, which is why I gave it 4 stars instead of 5. It still has a good flavor and we are going to continue ordering it. This is great lemonade at a great price! It tastes great, we've had no complaints. I would highly recommend switching to this if your contract allows! We sell lemonade and flavored lemonades and couldn't be happier with the taste of the Fox's. At events there are often several fresh squeezed stands and we generally outsell all of them with this bag in box product. The flavor is great and unlike fresh we don't have alot of mess or problems with inconsistency from less than ripe lemons. I can recommend Fox's lemonade to anyone. Great tasting lemonade and the cost of this box does not break your pockets like the name brand ones. It should come in a 3gl box would be much better. This lemonade is excellent when mixed with sweet tea. It is not too overpowering but provides a good contrast to the sweetness. We stock this during the summer months and it is a hot seller. 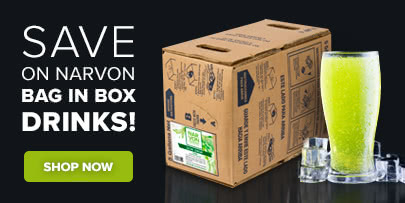 Save Up To $3.69 with our Recommended Product!